Hey there. One of the things that I wish I had more time for is fitness. This past year, my fitness routine has suffered. I don't have time for the gym, I don't have time to go run in the mornings (unless it's during the weekend), and I don't have time to do anything else but work. Sounds like a bunch of excuses, right? Well, I thought the same thing! No excuses! I have a body, I have arms and legs, have a heart, and I have a determination to get and stay fit! So... since time is a factor, I decided that I'm going to try several workout stuffs at home. I've already had a great start with one hell of a jump rope but that's mainly for cardio. I need something that's going to help make me look and feel stronger and nothing screams out strength like a well defined chest and arms! And to help me achieve those results? 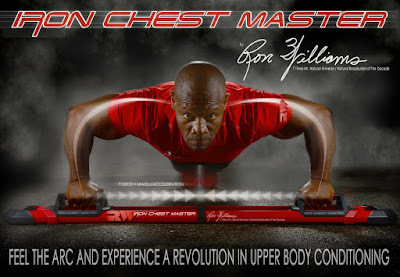 The Iron Chest Master by Ron Williams! 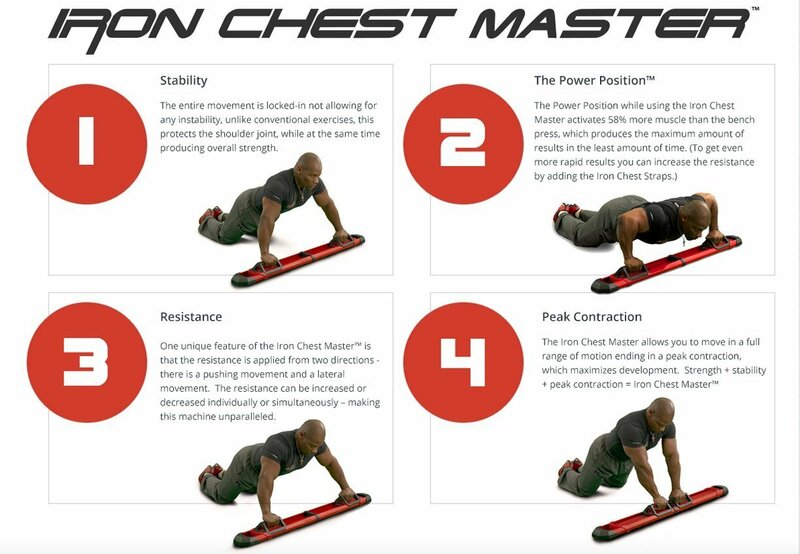 Our good friends at Iron Chest Master saw that I needed the workout and sent me the Iron Chest Master by Ron Williams to try out and review! After a few weeks of building a better upper body, I am ready to give you guys the scoop on this awesome home exercise device! So let's get right into my experience with this awesome machine! First off, first impressions... the Iron Chest Master is relatively slim but is pretty long. It measures 4 feet long by 5 and a half inch wide. I've seen other "push up" devices that do not measure anywhere near this long. Right off I wondered weather the Iron Chest Master is more than just a push up machine. As for the design, there are many things that work really well. 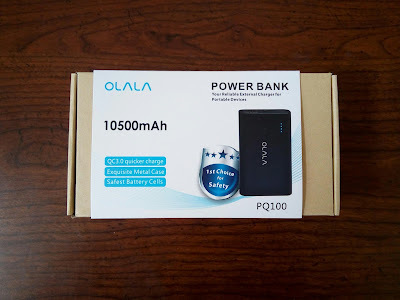 Each of the handles are covered is a soft rubber that provides excellent grip as well as comfort. This is a huge plus. If I am comfortable doing the exercises, I will more inclined to continue to do them. If for whatever reason my wrists or hands were uncomfortable, I wouldn't want to continue for fear of injuring myself. Each handle slides towards the middle in a pretty fluid motion. There are 3 resistant bands that attach to the handles and anchor to each end of the Iron Chest Master. You can remove resistant bands to make the exercises a bit easier. I thought this was great since the device can give you the option to gradually build your strength. Lastly, the color scheme... I absolutely love the black and red accents on the Iron Chest Master. You guys should know by now that black and red are my colors. Add in some silver and you have one great looking machine. Now, on to the exercises. Even though just by looking at the Iron Chest Master, I get a sense that I can figure out pretty easily how to use it. But still... I'm a visual learner and would rather see someone do it first or, at the very least, have a few instructional pictures. Thankfully, this comes with BOTH. You get a sizable sheet with 6 exercises (4 to be done with the Iron Chest Master) and how to do them correctly. And in case you are still having trouble with that, a DVD is included, showing you how to use the Iron Chest Master and starts you off with 2 workouts (The Iron Build & Burn and Iron Core). The exercises themselves all focus on the upper body. Some of the workouts will even work out your core. Another big plus for the Iron Chest Master. No pain... no gain... No pain... no gain! Now, I don't want to touch too much on the exercises that can be done. I don't know if they are highly guarded secret and you need to purchase the Iron Chest Master in order to feast your eyes on the workout. However, what I will say is that the Iron Chest Master not only provides a great workout but an extremely efficient one! This is EXACTLY what I am looking for. I don't have too much time to waste so when I am working out my upper body, I want to be able to get the best workout out that I can get for the minimum amount of time. Though it's only been a week, I do feel that the Iron Chest Master is pushing my upper body. My arms may not be feeling as sore as when I'm doing curls but my chest definitely feels more tighter. Even more so than when I was doing butterflies and chest presses at the gym. If that doesn't raise an eyebrow, I don't know what will. to get the most efficient upper body workout at home! 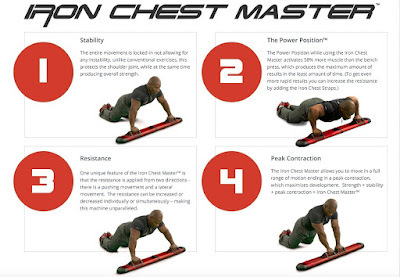 The Iron Chest Master by Ron Williams gives you just what you need from an exercise equipment that is meant to be used at home: stability, resistance, and easy to store away. Toss in a few workouts, a nutrition guide, and some fitness tips and this is a great way to start working on that sculpted upper body that you always wanted. I can't make it to gym as often as I want anymore, but I least now I have an efficient way to get that upper body workout in. And what makes it even better is that it's at the comfort of my own home. If you would like to read up on more technical details of the Iron Chest Master, head on over to Amazon! Later!